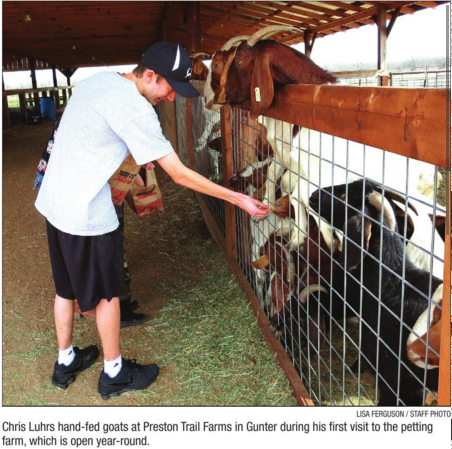 Those who want the opportunity to share some one-on-one time with farm animals need go no further than the Preston Trail Farms’ petting farm. Reporter Lisa Ferguson interviewed owner Rick Kimbrell for today’s Eedition of the Celina Record. As you can see from the picture, our animals are anything but shy. Be sure and come out this weekend, or anytime. The petting farm is open year round! Did you know that Preston Trail Farms is a family business? All of us have worked here since it opened, or birth – whichever came first! for 2018 – September 15th through November 21st!